Welcome back to Sunday Scratchups, your weekly recipe from scratch around grocery sales and affordable ingredients. 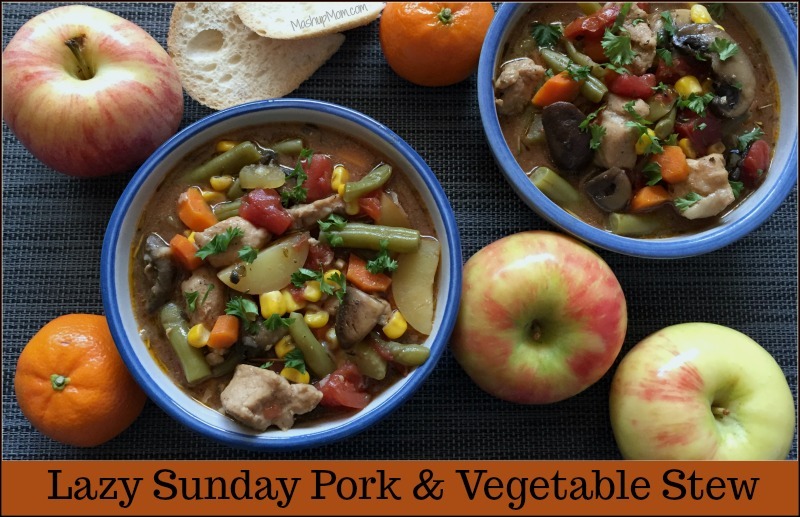 Up today: A Lazy Sunday Pork & Vegetable Stew recipe that simmers to perfect tenderness on your stove top across a weekend afternoon. Packed with potatoes, veggies, and tender chunks of pork, this flavor-packed stew is just the right comfort food for a cooler fall day. Combine 2 Tbsp flour with 1/2 tsp pepper and sea salt to taste, then chop up pork (if using chops or loin) and toss in flour mixture to coat. Heat 2 Tbsp olive oil in a large pot or Dutch oven over medium heat until shimmering, then add onion and saute for about three minutes, stirring occasionally. Add garlic and saute another minute, then add pork to the garlic & onions and cook for another five minutes over medium heat until lightly browned, stirring occasionally. 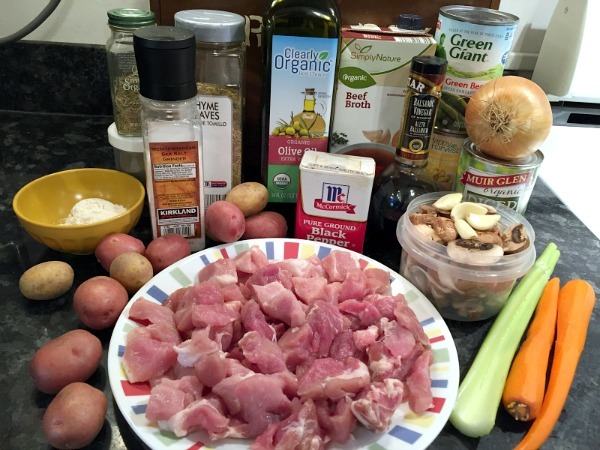 Remove pork, garlic, and onion mixture to a separate bowl. Add another Tbsp olive oil to the same pot, then add carrots and celery and saute for over medium heat for three minutes, continuing to stir occasionally. Add mushrooms and saute for another three minutes. Stir in broth, balsamic vinegar, tomatoes, potatoes, thyme, rosemary, pepper, and bay leaf. Add pork and onions back in, increase heat to high, and bring to a boil. Reduce heat to medium-low, cover pot, and simmer for another hour (or until potatoes are tender), stirring occasionally. Remove bay leaf from pot. Stir together 2 Tbsp flour and 1/4 cup water in a separate small bowl, then stir the flour mixture into the stew to thicken it slightly. Stir in drained corn and green beans, then continue to simmer uncovered over medium-low for another 10 minutes. Serve garnished with chopped fresh parsley, if desired. 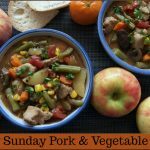 This pork & vegetable stew is a nice alternative to traditional beef stew recipes, and can also be more affordable than beef stew when you find pork seasonally on sale. Mr. 10 and I can’t stop eating it, and I think that it tastes even better reheated the next day! Try yours with a crusty sourdough or baguette, or serve with a simple side salad. 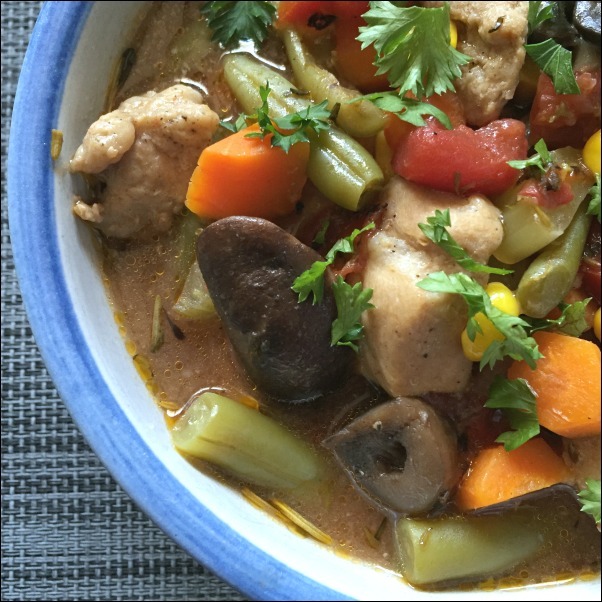 Packed with potatoes, veggies, and tender chunks of pork, this flavor-packed stew is just the right comfort food for a cooler fall day. Heat 2 Tbsp olive oil in a large pot or Dutch oven over medium heat until shimmering, then add onion and saute for about three minutes, stirring occasionally. Add garlic and saute another minute, then add pork to the garlic & onions and cook for another five minutes over medium heat until lightly browned, stirring occasionally. Remove pork, garlic, and onion mixture to a separate bowl. Add another Tbsp olive oil to the same pot, then add carrots and celery and saute for over medium heat for three minutes, continuing to stir occasionally. Add mushrooms and saute for another three minutes. Stir in broth, balsamic vinegar, tomatoes, potatoes, thyme, rosemary, pepper, and bay leaf. Remove bay leaf from pot. Stir together 2 Tbsp flour and 1/4 cup water in a separate small bowl, then stir the flour mixture into the stew to thicken it slightly. Stir in drained corn and green beans, then continue to simmer uncovered over medium-low for another 10 minutes. I threw my stew together with the vegetables I had on hand, but you could certainly change these up and/or add in your own favorites. Great recipe! 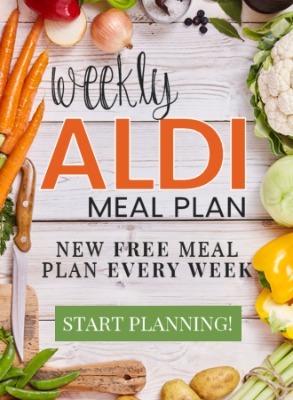 I’ve been looking for new recipes to try for the fall so I will definitely keep this one in mind! Very good recipe. I don’t eat pork but I would substitute it with chicken or beef. Perfect for fall. Great stew. I was a little hesitant to add the beans and corn at the end since it already seemed to have a lot going on, but it turned out great. Definitely a new family favorite. Wondering if this could go in the crockpot? I was thinking that maybe I could follow the first couple steps with browning everything and then put it in the crockpot. But I’m not sure how long I would leave it in the crockpot if I did that or at what temperature setting. In the Crock-Pot, after browning I’d try 6-8 hours on low, til the pork is tender. What size is the fire roasted can of tomatoes please? Just the regular smaller 14.5 oz can. 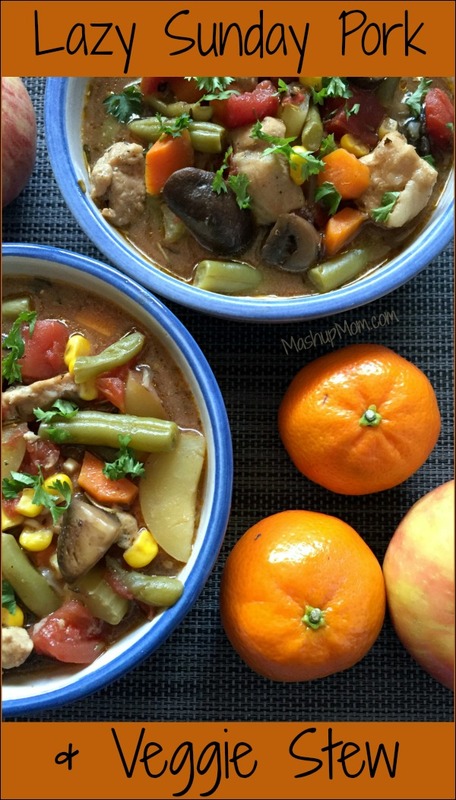 I am making this stew today but my husband likes a thick gravy for stews not “watery” can I double the flour/water ratio for thickening or should I use cornstarch instead? I haven’t tried either, because we prefer ours less thick 🙂 — I’d probably try the flour method, though. Let us know how it turns out! 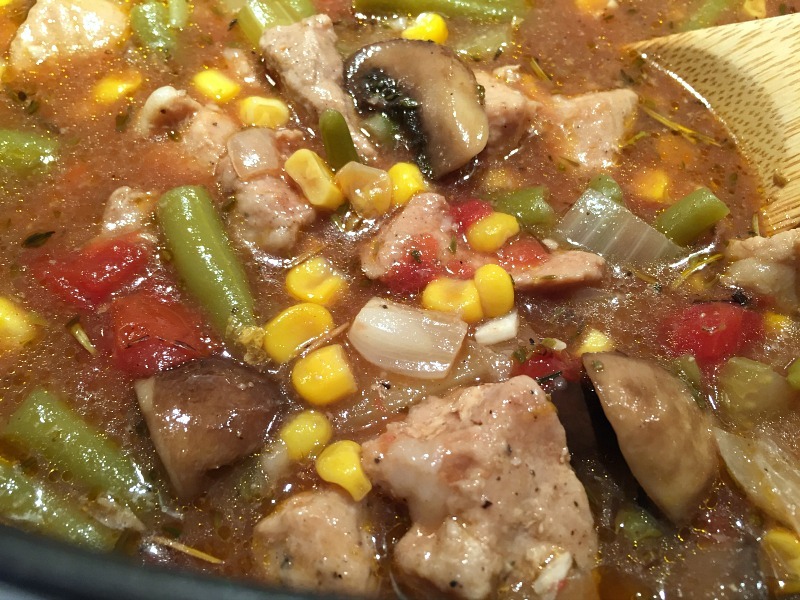 II doubled the flour/water to make a thicker gravy – it was perfect, I used frozen corn and fesh green beans – one of the best stews we have made – so flavourful, made enough to freeze for future meals for two.